A Cinefessions Series Review is a periodic column that sees one more writers watching and reviewing an entire film series. Cinefessions considers any film franchise that has two or more films a series, and thus available for review in this column. This is an excellent way to get a quick look at an entire collection of films in one column. Today, Ashe visits one of our favorite mega-universes: the Alien/Predator Universe. 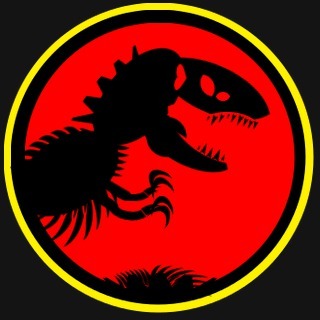 As much as Fox and Ridley Scott want to pretend that their awful attempts at making the Alien and Predator universes function in the same space failed miserably by not actually setting their crossover films in the future, we here at Cinefessions like to go with the films all being in one big, less than happy universe. This means that my series review is going to cover all the Predator and Alien films, along with Prometheus and the two Versus films. I watched all these in chronological order, not release order, so that’s how you’re getting the reviews. Sit back, enjoy my wild ride through a set of franchises I love, and watch the smoke fly as my two cohorts get to my Prometheus review. A botched mission with a military rescue team sees the elite soldiers facing off against a hunter from another planet looking to take them out to make some trophies. When you break it down like that it sounds like a number of B-movies that have been out in any number of years, but this one is still fantastic. 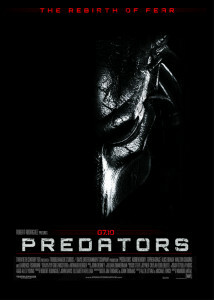 Predator has some great shots, great pacing, and some of the better banter in an action film before or since. Schwarzenegger and his crew of experts are well cast, and deliver the dialogue and attitude that a group like that would have perfectly. It’s a great ‘80s action flick from start to finish, with an amazing soundtrack and effects to go with that action that easily stand up even today. The Predator is intimidating as hell, and the big reveal has some serious weight to it with how little we see of it throughout the film, and that we see most of his actions through his eyes. Just about perfect in its execution. While a crime wave is heating up in Los Angeles turning it into a war zone, the alien hunters are back and have started taking their hunt into the LA area with one lone cop and a crack government team trying to take it out. I used to like this one a lot more. I mean, a whole lot more. My friends and I used to watch the first film and this one back-to-back for the longest time. I’m not sure I can do that anymore. 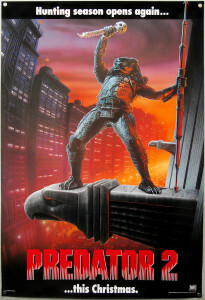 They do some neat things with it, but while Predator feels like an ‘80s action film, and can still stand on its own, Predator 2 wallows in its ‘80s cash-in feel. Sure, it was released in 1990, but it was definitely made with the ‘80s action mindset. It changes things up with the setting and gives us some side plots which I do like, but it hasn’t aged all that well, unfortunately. It’s not the effects work, which is pretty good, but rather the dialogue, the half assed, “near future” setting, and a few other things that have let this one drop. When scientists discover something in the Arctic that appears to be a buried pyramid, they send a research team out to investigate. Little do they know that they are about to step into a hunting ground where Aliens are grown as sport for the Predator race. There are some good moments in this film, but they’re overshadowed by the filmmakers completely mucking about with established continuity. They wanted to throw in pyramids instead of just simply adapting the comic, which had a far better storyline with characters we could actually care about because they weren’t just fodder for this hunt. I actually reduced my star rating on this one from a previous score I’d done on it a while back because I’m older, and easily annoyed with simple things that could have made the film work. I expect better from both franchises, and instead they basically tossed away what didn’t make their garbage plot work, and went with it. Freddy vs Jason had more respect for the properties it mashed up, and their fans, and that’s just sad. 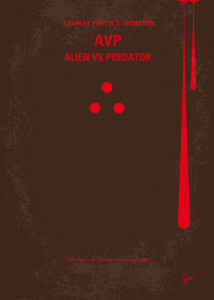 A sequel to 2004’s Alien vs. Predator, the iconic creatures from two of the scariest film franchises in movie history wage their most brutal battle ever – in our own backyard. When the Pred-Alien causes the ship to crash, the Predators send in a cleaner to wipe up the mess, only the aliens are getting out of control in a small town, and the military is looking to clean up before they get out. I like this one better than the first, if only because they fixed a number of continuity issues with the first, but they basically had to pick up where the first left off and try to salvage it with some success. The characters aren’t quite as dumb and cookie cutter, but they have their moments. Where the other film kind of took what it wanted from both franchises, this one pays more direct homages with the music, effects, and even dialogue and situations. This is both good and bad, and ends up with mixed results. The film also feels like it was shot by two different cinematographers as they can’t ever get night scenes, or at least action sequences, lit quite right so you can actually see what’s going on. A mercenary named Royce reluctantly leads a motley crew of warriors who soon come to realize they’ve been captured and deposited on an alien planet by an unknown nemesis. With the exception of a peculiar physician, they are all cold-blooded killers, convicts, death squad members…hunters who have now become the hunted. I do maintain this isn’t quite as good as the first Predator, but after this viewing, and watching AvP, AvP: Requiem and Predator 2, this is worlds better than the other sequels. They do something new with the Predators, but keep the mythology alive and moving, and I realized what an awesomely diverse cast they had in this on top of having characters that were tough, but that I actually gave a crap about. While there are some pacing issues going out of the second act and into the third, the action is great, there’s a feeling of dread throughout, and a fantastic mystery for the characters to solve. A team of explorers discover a clue to the origins of mankind on Earth, leading them on a journey to the darkest corners of the universe. There, they must fight a terrifying battle to save the future of the human race. I really enjoyed this in theaters but some time after I bought the Blu-ray, and after the second time I’d watched it, the shine had started to wear off and the film frayed at the edges. It’s only gotten worse on repeat viewings. There are some great moments in this film, but they’re pieced together with some rather gaping plot holes, and entirely too stupid character decisions by people who are much smarter than they act. They explore some neat ideas in this by trying to make a theological exploration with science fiction, and even if they added in the deleted scenes for a longer cut, the film is severely flawed. 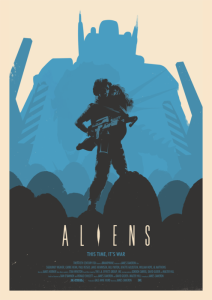 It is gorgeous, but tying it in with Alien and that franchise actually hurts the film more than helps it. 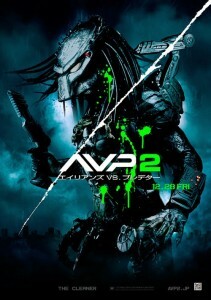 Even discounting the ties to the AvP franchise, the continuity between this and Alien doesn’t work so well. The pacing is okay, but the characters we don’t get enough time with the characters we like, and the ones we could care less about hog the screen. I do want to like the film, and I want that magic it had in the theater for the first time back, but the more times I watch it, the more faults I find in it, and that drives me nuts. During its return to the earth, commercial spaceship Nostromo intercepts a distress signal from a distant planet. When a three-member team of the crew discovers a chamber containing thousands of eggs on the planet, a creature inside one of the eggs attacks an explorer. The entire crew is unaware of the impending nightmare set to descend upon them when the alien parasite planted inside its unfortunate host is birthed. 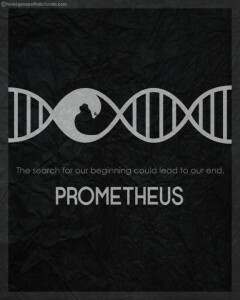 Watching this right after Prometheus makes me wonder what happened with the other film. 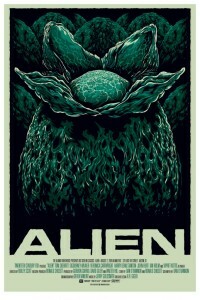 Alien just oozes atmosphere, and while a few of the characters make poor choices, they fit the characters. The set design, along with the alien design, is fantastic, looks lived in and functional, even if some of the technology seems dated from what we have now. It’s everything I want in a horror flick about an unusual alien species. This feels like we’re tagging along in a living breathing world and it’s still very easy to love. The pacing and build-up of dread is perfect here and was a high bar to set for the future of what would become a franchise. When Ripley’s lifepod is found by a salvage crew over 50 years later, she finds that terra-formers are on the very planet they found the alien species. When the company sends a family of colonists out to investigate her story, all contact is lost with the planet and colonists. They enlist Ripley and the colonial marines to return and search for answers. This is just as good a film as the first one, but they change up the formula completely. Where the first film replicated the haunted house motif, this one opts to go the zombie horde route, and that coupled with Cameron’s great dialogue, characters and effects work make this sequel to the first film work so well. There is a sense of dread and build-up, but it’s in more an action film kind of way mainly because our heroes actually have effective weapons against the aliens this time. I have to recommend the director’s cut over the theatrical as there is a lot more development for Ripley and Newt as well as the addition of a few moments that add to that horde attack feel and make you realize how smart the aliens really are. Couple all of that with one of my favorite animatronic beasties in the alien queen, and you have one of my top favorite films of all-time. After escaping with Newt and Hicks from the alien planet, Ripley crash lands on Fiorina 161, a prison planet and host to a correctional facility. 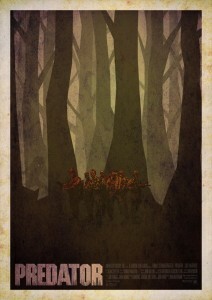 Unfortunately, although Newt and Hicks do not survive the crash, a more unwelcome visitor does. The prison does not allow weapons of any kind, and with aid being a long time away, the prisoners must simply survive in any way they can. This film had some production problems that you can see interfere with the title alone, which pegs this as “Alien Cubed”. In an effort to seem dark and edgy, two of the reasons that Aliens worked so well are offed before the film even gets going. Production issues, constant rewrites, a complete overhaul after they’d already started building sets, and then constant interference from the producers led the theatrical cut and the filming process to be a mess. The production cut fares a bit better as there’s at least more development across the board, but it still has some of the rough effects work, and the sound is all over the place because of where they pulled the new clips from. If I go to watch this one, it is the production cut not the theatrical run every time. It’s still a bit of a mess, but definitely feels like a more complete film, and is much closer to what we should have gotten in the first place. 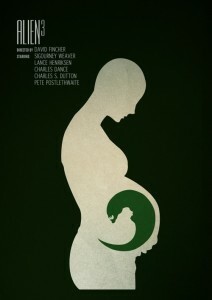 Two hundred years after Lt. Ripley dies, a group of scientists clone her, hoping to breed the ultimate weapon. But the new Ripley is full of surprises, as are the new aliens. 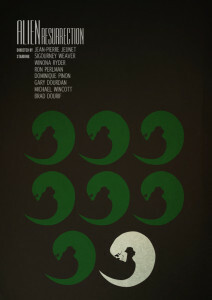 Ripley must team with a band of smugglers to keep the creatures from reaching Earth. Despite not being a fan favorite, I actually do like this one. It has the unfortunate luck of pairing a director that didn’t match the script, and a studio willing to muck with it all again because they didn’t learn their lesson the last time. I like that they got inventive in bringing Ripley back. I like most of the characters and actors in this. I don’t like that they don’t really do anything to make us even remotely like or attached to any of the characters beyond Ripley, though. Even that is mostly from our exposure in the other films. The pacing and events in the third act are a little off, and I really don’t like the “newborn” design or the aliens when they go full CGI with them. Still better than the alien with the green screen issues in Alien 3, however they never quite match up on screen and it smacks of the ‘90s habit of tossing practical effects out the window just because we had CGI to make it happen with. The Director’s Cut changes the beginning and the ending a bit, but overall does little to change the meat of the film. This still leaves me wondering if they’d stuck closer to Whedon’s original script, if it would have been a much better film. Alas, we’ll never know. After they’ve just escaped the hive in the marines ground vehicle, and the classic “nuke the site from orbit” scene plays out. The average film rating for the Alien/Predator Universe is 2.9 stars.